← Why do I get ads in software I’ve paid for? I rant quite often about how journalists and people just take the numbers and statistics given to them at face value. People rarely question them and very often conflicting numbers never get questioned nor does anyone inspect the detail. Even if someone does inspect the detail, such as the IFS, then the government either says their work is a ringing endorsement or shouts lots and says their figures fail to include important items and when included, this really is a good policy rather than a bad one. The nation is simply not mathematically literate enough. Thus I fully expect this to be completely ignored. There is no need to read on. As we all know the UK economy is in a bit of a pickle. We are running a budget deficit of around 11.4% per year which is quickly mounting up. Clearly the government has to take action as we can’t borrow that much every year indefinitely. The argument of course is about how much to cut and whether said cuts will cause the economy to fall over again. Even with the coalitions speedy and hefty cuts, government debt is not expected to be back to pre-recession levels until 2030! We are going to be paying for quite some time. I’m not going to spend time discussing policy, instead I’m going to focus on one thing, employment. The government cuts will result in around 0.5 million public sector workers losing their jobs. That’s roughly 1 in every 60 people employed (and this ignores any related private sector job losses). The government has said that the private sector will create the necessary jobs to keep all these people employed. But can this be true? To try and find out I’ve been digging through some ONS numbers. 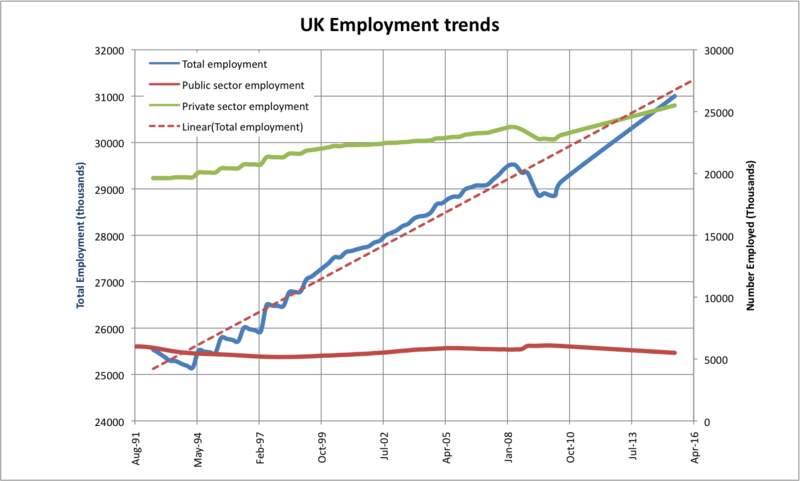 The graph above shows a couple of things, firstly employment has been growing pretty steadily since 1991 to 2008. This is partly through a greater percentage of the population working and partly via population growth. If we assume that we want to get back to the happy pre-recession period then we need employment to recover and continue to grow at the underlying rate. This is my first assumption, unfortunately there is a rather large blip in the mid-eighties which might lead you to question it but I think it is reasonable. Thus I am suggesting that we would like everyone who wants a job to be able to find one. Hence by 2015 we would like to see 31 million people employed in the UK (though this ignores the governments plans to try and get significant numbers off benefits and back to work). The second thing to note is that the majority of this increase in the total number of employed has come from the private sector. 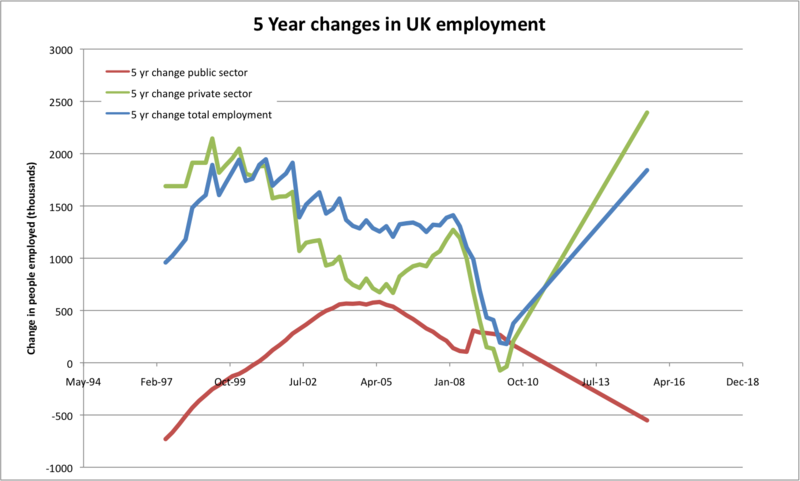 Public sector employment has oscillated from 5.5 million to 5 million before climbing back up to 5.5 million it is today. I find that in itself quite amazing given how much of the public sector has be outsourced or sold of and privatised since the nineties. There is presumably a lot of public sector workers doing a lot less work or we have created a lot of additional beacurcy. As we are concerned about what is going to happen to these 0.5 million public sector workers over the next five years it makes sense to look at the changes in employment over a 5 year time scale. Which is exactly what I have plotted up in the next graph including an extrapolation out to 2015 assuming we sack the previously mentioned number of public sector employes and bring employment up to trend again by 2015. Thus we can see that the private sector will have to create 2.5 million jobs over the next 5 years. Is that possible? Well coming out of the recession in the nineties and into the dot com boom generated 2 million jobs. We’re looking for a 25 % improvement on this. There does appear to be some correlation between public and private sector, notably when the public sector has been falling before, the private sector has appeared to increase at a greater rate. Can it happen, well it is a difficult call, in the late nineties credit was becoming readily available and very cheap, it is unlikely we will see such availability of credit from the banks in the next five years. This will make it hard for companies to get hold of cash to expand/startup etc. Of course at some point I believe the Bank of England will have to increase interest rates to deal with inflation and to normalise rates, having them close to zero indefinitely is not a good idea. Hence the cost of borrowing is likely to go up in the next 5 years. On the other hand you have to account for the fact that people lost jobs during the recession so coming out of a recession will naturally result in a greater increase in jobs. I think if a second significant dip in the economy can be avoided (which I’m not sure about at all) then 2-2.5 million jobs seems feasible given the depth of the recession and previous trends. I would be highly surprised if it came in over that, which probably spells trouble, either for some of those public sector workers or the governments plans to get people of benefits and back to work. Either way if the coalition lasts till 2015 there will be plenty of criticism for them going into the next election. If it doesn’t last till 2015 there will probably be even more criticism. The one thing I’ve learnt from this little exercise is that it’s hard to find the numbers you want to use (probably because we didn’t record them) and this makes attempting to extrapolate them a complete hit and miss affair. Such is economics.